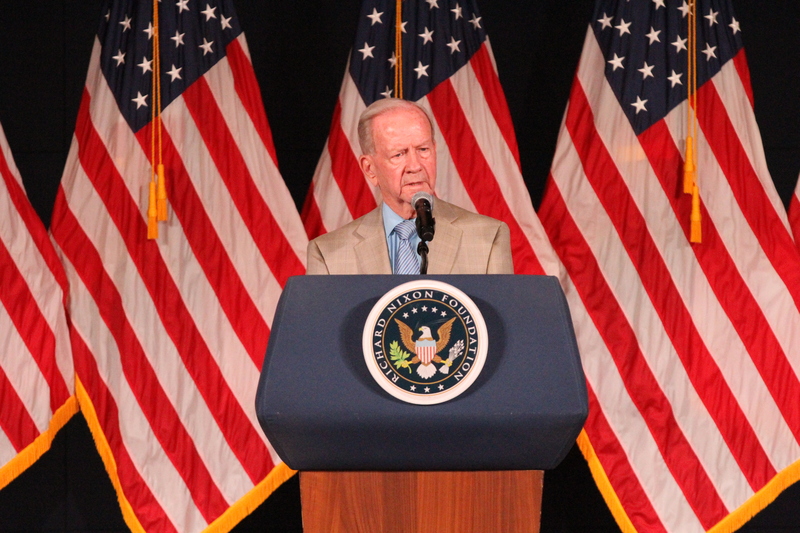 The Richard Nixon Foundation welcomed former National Security Advisor to President Reagan Bud McFarlane to the Nixon Presidential Library to discuss challenges facing our national security. McFarlane, whose distinguished record of public service includes ten years in the White House and at the State Department, gave insight as to how President Nixon may tackle threats to our national security across the globe. Specifically, he discussed the challenges facing Europe as it recovers from the global financial collapse of the 2000s and increased immigration from the Middle East. McFarlane stipulated that European countries are facing risks from changes in immigrant flows and financial imbalances. Prior to his lecture, Bud McFarlane spoke to seven graduate students from Chapman University, all of whom are pursuing a Master of Arts in War and Society. “[McFarlane] took us on a journey from the 1950’s to the present, from Naval Academy days with then-ensign John McCain, to strategy sessions with President Reagan and his cabinet, to current global threats in Asia, Africa and the Middle East, all within the span of salad to dessert,” students wrote of their time with the former National Security Advisor. To watch McFarlane’s comments in full click HERE.